i play has received three reports of pieces detaching from the rattle. No injuries have been reported. 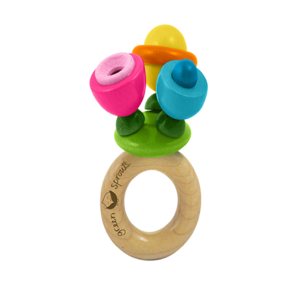 This recall involves the Green Sprouts brand flower rattle made from wood. The recalled multi-colored rattles are made from natural wood and measure 2.5 inches long by 2.5 inches wide by 4 inches high. Attached to the circular handle are three round wooden balls shaped like flowers, including one that contains a silver metal bell, all attached with an elastic cord. “Green Sprouts,” “Made in Taiwan” and a date code number (14714 or 21815) are printed on the circular rattle handle. Whole Foods Market stores and other stores nationwide and online at Amazon.com and other websites from December 2014 through October 2018 for about $15. Consumers should immediately take the recalled rattles away from children, stop using them and contact i play for instructions on how to receive a $50.00 coupon code to redeem towards the purchase of new products and shipping costs. i play at 800-876-1574 from 9 a.m. to 5 p.m. ET Monday through Friday, email at contactus@iplaybaby.com or online at www.iplaybaby.com and click on “ Health & Safety ” for more information.